It’s time to tear down those boring kitchen walls. Modern kitchen designs are all about open floor layouts. There are many ways to liven up your house with a bright, spacious open floor kitchen. An airy, inviting space that brings everyone together for some fun times with food – what can get better than this? Open floor layouts provide ample highway for your creativity to zoom past you and give you various opportunities to design the most favourite part of your home. It is also a great way to encourage interaction and entertainment in families. Experiment with unique furniture and cabinetry to seamlessly segregate your kitchen space from other areas of the house. 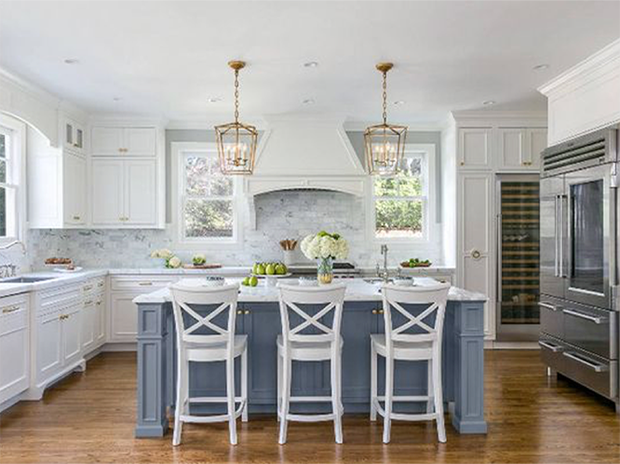 Gone are the days when elaborate designs and conventional décor worked for kitchens. Now it’s all about sleek designs, bare essentials and minimal décor. If you haven’t already, be prepared to give your kitchen a hi-tech makeover with smart kitchen innovations. This is the era of digitalization and technology. And your kitchen designs should reflect this in their style. Modern life is hard and fast, so you can’t have a kitchen that cannot keep up with this demanding lifestyle. A new generation kitchen has all the tech that makes cooking easier and faster along with smart solutions that make storage efficient. Think of deep drawers, built-in appliances, corner storage racks, and under-the-counter appliances that can be hidden from view. The key to remember is that when it comes to kitchen design ideas, less is always more. A rising trend in interior decoration is bringing Mother Nature home. Incorporate green elements in your kitchen to liven up the space. Imagine a bright, airy kitchen with ample lighting and a lovely touch of green nature – homely, right? Line up small pots of your favourite herbs on your window ledge, or add accents of green throughout your décor by placing indoor plants. Bring some colour and fragrance with a statement vase topped with some beautiful flowers. Decorate your kitchen in a jiffy by using apothecary jars. While they’re low on the green part, they do add a subtle hint of nature wherever they are. With open floor layouts for kitchens, single level islands are ideal to filter in adequate lighting in the kitchen. Island tops are perfect solutions for all your space issues. They not only provide generous work and prep space, but also offer innovative space for under-the-counter storage within your reach. You can also incorporate a warming drawer under it – a great solution for busy households. A kitchen full of light is a kitchen full of love. Highlight key areas of your kitchen by strategically placed lights. Filter in as much natural lighting inside as you can, let the house have a breath of fresh air. Wall-mounted lamps do a great job to illuminate essential work zones like the stove tops or island tops. When choosing lamps, go for statement pieces that grab the attention. You can add plenty of drama with rightly placed statement lamps in your kitchen. Whether it’s silver, gold or chrome – they are all here to stay. Just like last year, metals are going to play a dominant role in the kitchen space. Perk up your kitchen aesthetics with bright flashes of shiny metal faucets, cabinet pulls, overhead lamps, and kitchen hood. Contrast the metallic aesthetics with neutral colour tones and wooden accents for the rest of your kitchen. If shiny is too showy for you, metal or frosted metal finishing can work equally well. Add a dash of whimsy and complement with eclectic rugs for a bright pop of colour. Colours are what cement a room’s design. Any space can become lively and vibrant with the right use of colour. The upcoming year will see a rising trend towards neutral colours to exotic shades. Two-toned selections, with shades of clay, ginger, copper and oak, are expected to be the hottest palettes everywhere. However, choosing colours for your home is a highly personalized choice. Seasonal trends can only tell you which direction to go in, but you must enjoy the walk on your own. Often overlooked, ceilings have an unbridled potential to transform a room. Kitchen ceilings, in particular, can either shrink the place or make it look more spacious. Make your kitchen stand out by decorating your kitchen ceiling in your personal style. Since metals are in, go one step forward from fixtures and have surface mount metal ceilings. Another popular design element that can spruce up your kitchen is wood. Add wooden planks to bring some texture and warmth into the space. However, remember to keep the colour scheme consistent throughout. In a busy room like a kitchen, where metals and marbles take up more than half of the space, a window is often the softest element of design. So, bring in the pretty by giving your windows a decorative treatment. Flowy curtains with unique patterns can add a delicate contrast to the structured look of a kitchen. Roman shades or rollers in bright colours can also be used to bring some eye-catching element. Have fun with tassels, trims and folds to accentuate your windows. If you have a big family with lots of time to cook, a traditional farmhouse kitchen will allow you to enjoy every moment of the time you spend there. But if your life is a quick dash of events, your kitchen should complement and reflect that. Install modular appliances with quick processes so you don’t waste precious time. Furthermore, let all your creative juices running and design your kitchen with your unique style. Don’t be afraid to customize the above trends to your tastes. If a full scale remodelling is not in the scene for you, change a few elements. Add a striking backsplash or decorate with colourful appliances. Whatever you decide to do, make the place your own.